Welcome to some crisp fall weather! It’s getting to be that time of year again where the weather changes, the school buses are out, the pumpkins and ghost start showing up, and the leaves are finally starting to turn. Florence Oregon is seeing a little color change; some trees have made a quick turn to full orange and red but nothing is in peak as of yet. This weekend has a few fun events to note, Florence Kites and Habitat beach walk is happening at the Driftwood Shores Resort or perhaps this may be the perfect time for a drive up the North Fork Road for some scenic back roads with a view. It sounds like Salem is just starting to see the beginning of fall, there is a bit of yellow and red coming through, and some leaves are starting to fall in their downtown area. Even though it isn’t peak season, fall events are starting to line up in this region! Mount Angel Oktoberfest is Sept. 13-16 in Mt. Angel, Oregon. The 53rd annual German-style festival will celebrate with a blend of food, beer and family fun, including traditional dances, wiener dog races and live music. Tap Into Polk County with a weeklong celebration of local beer and harvest season Sept. 14-23. Events throughout the week will include farmers’ markets, block parties, culinary experiences and ghost walks. Portland is seeing some change in isolated spots, but hasn’t hit full peak. Good news is that it’s getting close! If you’re heading to Portland, there is still plenty of things to do indoors and out. Head over to the Portland Art Museum and see work by Avantika Bawa and if you get hungry Feast Portland is happening the right now though 16th at various locations through the city. Mt. Hood isn’t seeing much of fall color in its view yet, but you can still explore the fall season to come! On September 15th, take part in the Cider Squeeze at Philip Foster Farms. Philip Foster Farm brings out the presses for their annual Cider Squeeze at this event. You can bring and press your own apples or the farm’s apples or purchase delicious premade cider. Spend a day on the farm with family and friends and enjoy live music, food, games, and craft booths. Ashland is just now starting to see a change. There are sprinkles of red, yellow, and orange starting to pop around in places. While not quite yet the time to view the colors, you can head over to Mt. Ashland for a day hike. Medford Oregon is also just beginning to see some changes on the tops of trees. Some good fall viewing spots once we start to see more change are Roxy Ann Peak Trail, Table rock, and Prescott Park. What should you do there in the meantime? Check out the BrewFest and Battle of the Bones, Central Point Saturday Artisan Market, and the Rogue Valley Growers & Crafters Market. Sounds like Central Oregon is just starting to see some changes – which seems to be a common theme for all our regions this week! 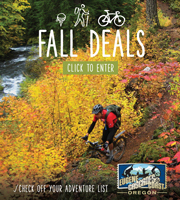 Head to Bend for their Oktoberfest from the 3rd to 14th, or head to Crooked River Ranch for Cars in the Canyon on the 15th, or a Fall free day on the 15th at Sunriver nature center. Also check out the Bend Oktoberfest, Cars in the Canyon, and Fall Free day. Be sure to check back next Friday and follow #ORFallFoliage to stick with where the leaves are changing and what family friendly events are being held across the state! It’s nearly the start of the season! Oregon Fall foliage is just starting to show as weather and seasons begin to change, but as of now everything is still mostly evergreen with minimal leaf color changes. We expect in the next 2- 3 weeks for colors to really start popping. Most places in Oregon haven’t seen much change yet, but we wanted to keep an eye out for some local events and things to do while waiting for the leaves to change! The coast might not have much of a change in leaves yet, but the Rods ‘N Rhodies Invitational car show in Florence this weekend 7th- 9th is a great way to spend the weekend, and a perfect way to send off summer days. The area sure has felt the fall come in but across the board leaves have not started changing yet. A few trees got an early start but most of the streets are lined with green trees still holding onto their leaves. Still plenty of events and things to do, while the weather is still nice and sunny. With the Coburg Antique Fair is this Sunday in Coburg Oregon, head over to the nearby Agrarian Ales between the 7th and 9 for the Hop Harvest Festival. Portland isn’t quite feeling the fall vibe yet, but they have plenty going on through the city in the meantime. Check out the Rose City Comic Con the 7th through the 9th, or signup for a Portland City Half Day Tour and explore historic downtown, the Park Blocks, and Portland’s living room – Pioneer Courthouse Square. Perhaps still you want to check out the corn maze and pumpkin patch on beautiful Sauvie Island in Portland, Oregon. It’s a similar story in this region. Before fall hits, head on down to the Columbia River for a first Friday art walk, or a wine tasting event, or listen to some live music. There are plenty of things to see and do down in the gorge. Columbia River Gorge is having a waterfall tour! Pass through Troutdale, Gateway to the Gorge, as you travel down the Historic Columbia River Highway stopping at the Vista House, Latourell Falls, Multnomah Falls, and finally the largest fish hatchery in Oregon – Bonneville Fish Hatchery. Be sure to stop by the sturgeon viewing center to see the 70 year old 450 pound Herman the sturgeon. Hasn’t seen much of a change yet, the trees are green with a slight dark orange on the tops, but that shouldn’t stop you from experiencing the view for some pre-planning at the table rocks. You can see almost the whole valley from atop a cliff, be sure to stay posted for the best time to see this stunning view in full fall color. In the meantime, while you wait for the color shift, visit the 13th annual fall classic car and truck show, the central point Saturday Artisan market, and free mini train rides. Colors are just starting to show; cool nighttime temperatures will help the process but as of now, no changes to report. Be sure to check out the local events happening this weekend. In Sisters, stop by The Sisters Folk Festival. There might not be much fall to report on yet, but plenty of activities to make it feel like fall or get you that last taste of summer before its all leaves and all harvest.